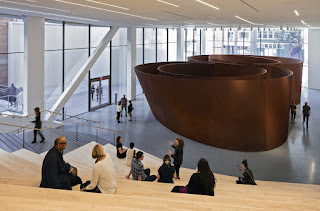 At SFMOMA today on her way to visit Richard Serra's massive steel sculpture, Sequence, Ciwt saw instead a huge dark grey wall with portholes and people couching to see through. "Oh no, she thought, "Sequence is leaving the building," and, sadly she was right. Actually, part of the building was leaving the building in order for that to happen. Sequence arrived before the renovated SFMOMA reopened in 2016. It was set in place and then a ceiling and walls were built around it. So, on its departure an entire glass and steel wall was removed from SFMOMA, Sequence was reduced to its huge parts, loaded on 12 flatbed semi trucks and readied for travel back from whence it came: the Cantor at Stanford. Ciwt will miss it.